Separate paths are less safe: Numerous people posted links to safety studies. There appears to be general agreement that separated cycle paths are less safe at intersections. Data from Berlin and Denmark show a marked increase of cyclist (and pedestrian) injuries at intersections after cycle paths were put in. (The results were adjusted for the increase in ridership.) The graphic above shows the relative risks for cyclists depending on where they are traveling. The most dangerous path is on the wrong side of the street. The safest is on the street. Safety through Design: Several riders from Europe commented that some safety concerns have been resolved through smart design. Above is a brief Dutch video that explains how the separate path can be designed so that cyclists no longer appear from behind the turning car driver. This design does appear much better than the ones we are implementing in the United States right now. However, the Dutch design assumes that both car and cyclist arrive at the intersection when the light is red. Most drivers and cyclists try to time it so that they arrive when the light is green. In that situation, the cyclist again can find themselves behind the car, and close to invisible. Another problem with separate paths is the inconvenience to the cyclist. Where a car driver can go straight, the cyclist has to make a right, a left, another left and finally a right turn to negotiate the intersection. And if the cyclist wants to turn left, she has to wait an extra light cycle, since she has to cross two traffic lights instead of one. For short bike trips, which predominate in the Netherlands, this is not a problem, but efficiency is key to making cycling a suitable alternative for the longer commutes that prevail in the U. S.
“Subjective” vs. actual safety: The advocates for separate bike facilities point out that most people feel safer on their bikes when they are separated from cars moving in the same direction. “Feeling unsafe” is the main impediment why many people don’t cycle, so getting more people on bikes requires making them feel safer while riding their bikes. Data comparing different countries shows that increased numbers of people cycling generally leads to improved safety. It is important to make people feel safe while riding their bikes, so that more people ride, which in turn leads to actual increases in safety. In the long term, this may compensate for the decreases in safety due to the separate bike paths. To me, the most important question is this: Are “perceived” and “actual” safety mutually exclusive, or can facilities be safe and feel safe at the same time? Turn-around in Germany: Germany, the country that started the trend toward separating cyclists to clear the roads for cars, now is going the other way. 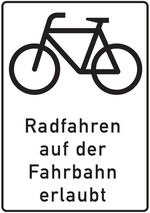 “Fahrradstraßen” (bicycle boulevards) are streets that are turned over to cyclists as the main users. Cars are still allowed, but are considered secondary users. Munich, the largest city in southern Germany, is installing on-street bike lanes and signs that legitimize cycling on the street (above), even where there are separate paths. This approach has been successful: Cycling has increased by 70% in the last nine years. In the next part of this series, I will examine whether Munich’s model may provide a better way forward for North American cities. It’s time to look at the data to see what works and what is safe. Update: We posted a proposal for design criteria for bicycle facilities in a later post. This entry was posted in Cycling Safety, Rides. Bookmark the permalink. I will not reopen the discussion with any comment. I think You covered it well. Sunday and into Monday (I am a slow rider) as I did my 400km I did spend more time thinking about bicyclepaths and perceived versus actual safety, than ususally, and on some bicyclepaths along 80kph roads I feel safer on the bicyclepath, and with others I chose to break the law and stayed on the road. Both due to bad condition and poor design. I tend to agree with many of your criticisms of separated bike paths (the worst I ever saw was a striped path on a railway bridge in Wisconsin that put southbound bicycle between and facing northbound auto traffic to the right and northbound cycle traffic to the left. Ugh! That being said, the times I have been involved in collisions, and there have been three, (a) I was not on/entering/exiting a bike path and (b) the major factor was the driver not considering that there might be a moving object (me) out there. One driver pulled a left across my path, one pulled forward out of a driveway and T-boned me, and one ran a stop sign and hit my rear wheel. This tells me that the primary factor in cycling safety is awareness–not only that of cyclists of drivers, but also that of drivers of cyclists. How can we best achieve this? I suspect that bike path advocates see this as one achievement of their constructions (bike path implies bicycles). But does it work? New Haven uses “Sharrows”–and I’m certainly aware of them *as a cyclist*, but I honestly do not know if drivers even notice them! Cycling boulevards: I rather think these are the next best thing to an infrastructure, both physical and legal (and cultural) that makes drivers continually aware of cyclists and responsible for their own actions wrt cyclists. Albuquerque, where I live, has several dedicated bicycle boulevards, but I don’t think that the planners went so far as to make cyclists the primary users — cars seem still to have principal right of way, or at least think they do. I started riding in traffic in the (compared to the US or western Europe) chaotic traffic of India and Kenya in the 1960s. Despite what by modern western standards was horrible infrastructure and negligent law enforcement, I saw only one serious bicycle accident in all that time — some six years — and I think this was because cyclists were just a part of the everyday traffic equation. Note that this was during a period when Kenya had, IIRC, one of the worst auto accident rates in the world — I saw very many horrible auto accidents in and about Nairobi than in much, much more crowded and chaotic New Delhi — probably because of the more sophisticated auto types and the freedom to reach US speeds (and quite a bit beyond) on relatively primitive infrastructure. Very good article! Just a note in case anyone wants to know what that German sign actually says, my translation is, “Cycling in the roadway allowed”. Great summary. I still think the cultural background is perhaps a determinant factor to successful cycling, such as where people on bicycles had been part of the traffic landscape since the bicycles became available in large numbers. Thanks for the useful summary of the two perspectives. My only complaint is I don’t think it was necessary to perpetuate Colville-Andersen’s gratuitous and gross mischaracterization of the entire “vehicular cycling” approach and its proponents. I actually took the link out this morning, realizing that we should discuss facts rather than deal with people who prefer polemics. Just noticed that, and I agree. Thank you!. So in summary, yes, there will always be conflicting studies (just look at global climate change), but the overwhelming evidence is clear: Installing separate cyclepaths decreases cyclists’ safety on the roads where they are installed. I don’t think we need to discuss this any longer. The bigger question is whether we are willing to accept this in return for higher ridership and the associated long-term improvements in safety. Or whether we can figure out a way that empowers riders to feel safe while increasing, rather than decreasing, their actual safety. I have to think that all this talk about infrastructure being a limiting factor of getting more people cycling is really a small part of it. I can only imagine that when asking an assortment of random people why they didn’t bike today, their answer will be more like, “You want me to do physical labor instead of driving? !” and not “I would if only there was a protected lane.” There are numerous barriers to getting more people cycling, but I’m just not convinced that cycling-specific infrastructure is what is holding people back. We already have a huge infrastructure of roadways which includes many low traffic areas which are more than sufficient and pleasant for cycling on, even in many urban areas. I think it simply comes down to laziness and routine. I think the studies are clear on this – more infrastructure gets more people cycling. You also need to consider the many people who try cycling and return to their cars, either because they perceive it as unsafe or because they actually get hit. Unfortunately, cycling safely requires awareness and skills that aren’t easy to pick up for novices, especially those who come to cycling as adults. It’s made worse that our North American driver training is so poor, and that we treat accidents as unavoidable – to be mitigated with airbags – rather than mistakes we should try to avoid at all costs. So when poorly-skilled drivers start cycling, they run much greater risks of having accidents, only this time with no airbags to protect them. Whether creating false safety with segregated cycle tracks is an improvement in this context remains debatable. This won’t work however unless everyone understands (and obeys) right of way rules. I think there is an absolutely correct answer. In terms of what is the best infrastructure for cyclists to use, the absolutely correct answer must always be the infrastructure that most professional studies find to be the safest. The fact that many people don’t like the answer does not make it incorrect – it only makes it unpopular. “Correct” depends on the question we ask. And then there is the “correct for whom”. One of the Copenhagen studies, for example, shows that children are safer on separate trails, but young women are much less safe. Young men seem to do the same on trails and on the street. Assuming that these results are statistically significant, the correct answer depends on who you are. The world is complex, and the best solution requires letting go of absolute concepts. We need to keep an open mind and be prepared to do things over if they don’t work. I assume the new Seattle cyclepath is one that will get a do-over sooner rather than later. Jan, your response doesn’t negate my point – my point still stands in all the specific circumstances you point out. What I was trying to illustrate is that certain advocates regard safety as job #2. I think that is the wrong answer. In terms of transportation, safety should always be job #1. We always balance safety versus cost and convenience, as well as other factors. Finding the right balance is the tricky part. I do not think USA and perhaps Canada are at the same historical point in terms of cycling being preceived as transportation, so perhaps we have to build the paths before we arrive to the point of removing them. It seems the main obstacle in North America is drivers’ awareness and acceptance of cycling as part of normal traffic. You make a good point, but I am more optimistic. We may be able to skip the separate cyclepath step, and go straight to re-designing roads so that all users can feel and be safe. In Europe, they are slowly getting there. I find that most drivers accept the notion that roads are for cars, even when they start cycling. That is the big issue especially in Europe, where bikes have been banned from the roadway for so long that it’s inconceivable that you could cycle on roads. For example, when I mention to Europeans that it is legal (albeit not very pleasant) to cycle on the shoulder of major highways and freeways, they cannot believe it. Yet it’s relatively safe, at least until drunk drivers come out at night. Thanks for staying with this Jan. Never mind the demagogues. They will always be with us. Driver and rider attitudes need to change. You are right – the best facilities don’t do much without awareness. Fortunately, there has been huge progress on that front. It’s amazing how much more pleasant cycling in Seattle is these days compared to 5, 10 or even 20 years ago. Everybody seems so much nicer these days, and so much more aware of cyclists. Whether it’s the larger number of cyclists, the sharrows on the road, or a combination of all – it’s working. In some other cities, it may take a little longer, but there is light at the end of the tunnel. Thank you for the follow up. I was a little bummed to read the first article, in that I too think that having lanes is and people ‘feeling safe’ is better than not having lanes and having less people riding. It’s distressing to see that people in the cycling community have polarized views of this, when we need infrastructure so badly. If we disagree on what we need, how will we ever get anything done? Thanks again for showing more sides to this. I appreciate the follow-up article – very well done and clearly illustrated. I also found good info in the comments – so keep it up everyone. I learned early in my architectural work that conflict situations in site design – parking lots esp, but also door swings – are opportunities to make good, or bad decisions. Design awareness, just as driving alert, are both important. We’ve had “Start seeing motorcycles” signs all over the area, and now I’m starting to see these refer to “cycles” in some towns. (Off-topic) When I was a wee novice rider (1950’s), we lived in a town of 1200, and rode everywhere – blacktop, sidewalk, grass. There were some households that had no car and roads were mostly 2-way without lane markings. Intersections were 4-way stop signs except the highway. We knew we should take side streets and alleys instead of the highway, to esp. avoid the trucks. Compare that to now where some households have 5-stall garages and still have to park on the street, and almost every thru-street is multi-lane. It’s no wonder that rails-to-trails movement and proponents of separate bikeways are so popular, providing a place to take the kids out to learn to ride a line, go a bit further between stops/intersections, etc. with little or no motorized traffic to conflict with. We’re lucky in Central Illinois to have a great selection of county blacktops and some rail-trails as an option for training to get the fitness and some of the skills to ride well on the road. Over the past few decades, our local road club has continued to use these outer roadways, and to add city group rides (after work hours), and I’ve seen an increase in bike commuting to work (usually on secondary streets). Bike lanes are the exception here – a multi-modal urban river bridge, a “green” lane along a one-way truck route arterial street, and the City is starting to experiment with the round-a-bout after visiting Carmel, Indiana. Look forward to more posts on urban riding safety, as I also try to keep up with AASHTO publications that DOT’s use as standards. In your last blog commmentary followup you identified several routes in Seattle that merit a cycle track. Ballard, the piers south of downtown. I also suspect you’re not opposed to the path network around seattle that already exists. 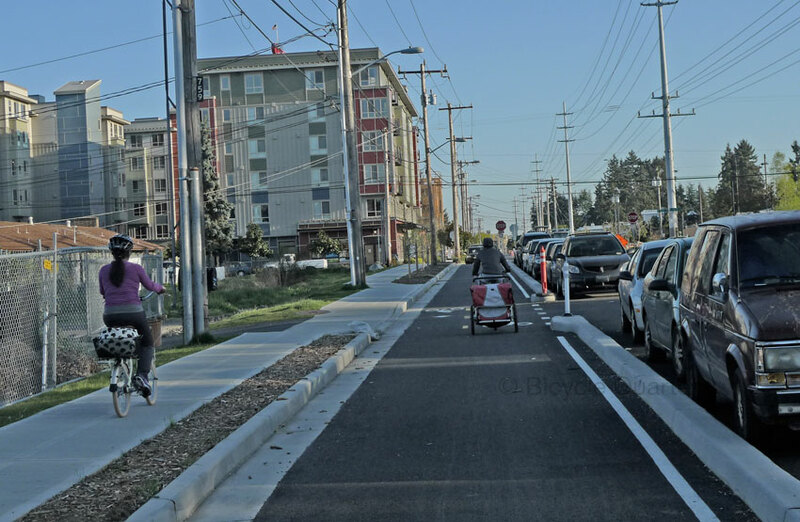 Seattle IS putting in bike boulevards, in addition to enhancing several routes with a path network. Extending the interurban trail into Seattle IS ONE OF THOSE PATH COORIDORS. Yes, in some placements cycle tracks are unsafe. But, like you said in your last blog posts on this, ‘separation will be your first choice always’ if it can be well designed. 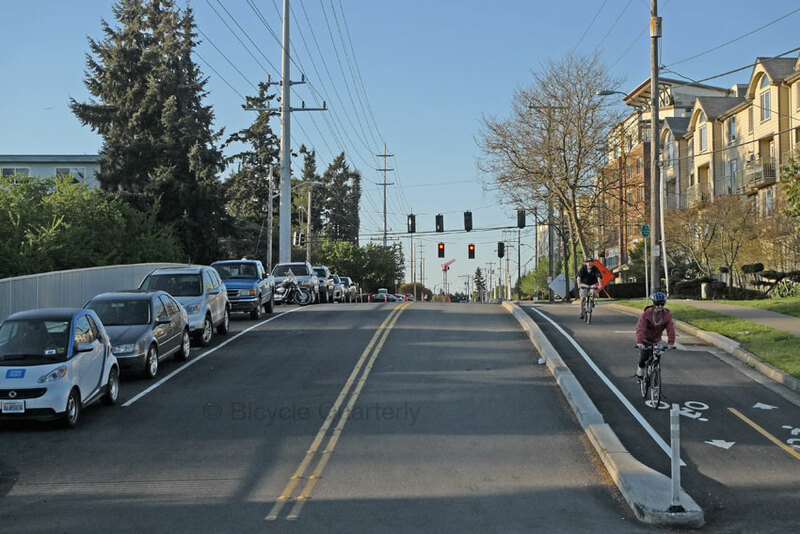 Work to get the Interurban cycle track IMPROVED. There are numerous parallel routes, some with bikeway designations. Seattle needs a wide variety of context appropriate designs, and you yourself identified several in Seattle where cycle tracks and separated paths make sense. Cycle tracks can coexist with bikelanes, bike boulevards, and plain old streets in a smartly designed city. Dont like the Interurban cycle track? Get it fixed, instead of throwing up half baked roadblocks to their implementation. Wouldn’t like to hold up the Missing Link Shilshole cycle track, would you, Jan? This blog post is not about one single facility. Our readership is world-wide. The main issue here is that poorly designed “protected” bike lanes, cycle tracks, etc., are being installed, designed and planned all over North America. When you look at images from Chicago, Washington DC or Seattle, the new trend seems to be to put cyclists on the wrong side of the street. With few exceptions (where there are no intersections for many miles), this is not a good idea. More specifically, the Bitterlake cycle track has too many intersections to be safe. It also doesn’t have high enough traffic speeds to make separation necessary. So the way to improve the cycle track is to remove it. I agree with you that the best solution is a mix of facilities. Unfortunately, it does not appear that good criteria have been established to determine which facility is best for a given street. I am aware of the Bicycle Boulevards, and I hope the concept will catch on. Fremont on the Interurban corridor is a great candidate. Right now, every intersection is unsigned, making it dangerous for downhill riders who travel at a good rate of speed. Simply giving that street the right-of-way, and disallowing cars (except for local residents and deliveries) would be a huge improvement for that corridor. I totally agree with your analysis. In Brazil the situation is much worse. There is a master plan and no consciousness of the population to the issue of bike lanes. Here, traffic is a real war. A recent study on US cycle tracks showed their crash rates to be lower than cycling on the roadway. Since context is important, and Jan, you yourself have identified several traffic corridors in Seattle that merit cycle tracks. You’re not suggesting cycle tracks are ALWAYS less safe than riding in the street, are you? From a recent study by Anne Lusk, et al. publishing this month in the American Journal of Public Health on US cycle tracks…. Cycle tracks can be, and if designed with an eye to the details, will be safer than lane proximate accomodation. Perhaps Jan, it’s possible to think of cycle tracks and paths as being the backbone of a cycle network in any community. The biggest problem is that the study compares accident rates on cycle tracks with the general accident rate in the U.S.. That is highly misleading, because we all know that cycling is safest where most people cycle. Cycle tracks also exist where most people cycle. So of course, a cycle track in Seattle will be safer than riding on the roadway in rural Florida! In the very least, they should have estimated the on-the-road accident rate for bicycles in each municipality where people cycle. So the results give us an idea of the accident rate on trails, but we don’t have any basis for comparison. Thus, the conclusions of the study are not supported by the data. Mike, you should be aware that Anne Lusk is a cycle facility advocate posing as an unbiased researcher. Her ‘studies’ are flawed by selection bias and experimenter bias and should be viewed with extreme caution, not least because they fly in the face of almost every other cycling safety study done over the last 40 years..
And she’s a public health professional (with emphasis on nutrition, I think) making traffic engineering recommendations with no traffic engineering training or work experience. It’s one thing to say more people should bicycle because it’s healthy; we know that’s true. It’s another to make specific engineering recommendations in the name of achieving that goal. I am less concerned about purported expertise, if the study is done well. There is a lot of potential for interdisciplinary research, and scientific studies follow a similar pattern, no matter the discipline. That is how I can evaluate this study, even though my Ph.D. is in geology. There always will be poorly done studies, but the peer review process is intended to ensure that they don’t get published. I am surprised that the study above made it through the review process. If I had been a reviewer on this paper (I used to review papers for journals), my recommendation would have been “not acceptable for publication without significant additional research”. I am a bit concerned that this study apparently is being used to make public policy decisions. Jan, you realize in the last couple of days at your blog you have both been critical of cycle tracks, while at the same time calling for their implementation to complete significant cycling routes in Seattle, and consider them the best choice for these corridors. Even one that crosses a fair number of working, industrial driveways and passes a working cement mill with cement truck traffic crossing it regularily. You consider the cement mixers and other industrial traffic on this one cycle track corridor managable, and wholeheartedly endorse, and are working to get it implemented. Some perspective is in order. Context is important. Sometimes, separation is the best choice. At the last blog commentary, you considered it your first choice always, if it can be well implemented. My concern is that cycle tracks are becoming the preferred choice in the U.S. everywhere, not just in the (relatively few) locations where they are appropriate. Jan, what’s called for is for you to write ANOTHER followup to this blog post, talking about how, when and where you endorse cycletracks. Balance the critique out, since you actually consider separation the best choice if it can be done well, as you pointed out the other day at your last blog commentary on the subject. Given the overwhelming criticism of a bike facility design you actually endorse, some balance to your discussion is in order. Why, for example, you consider a cycletrack to complete the missing link in Ballard appropriate, even though its through a very busy, commercial neighborhood with lost of daily traffic crossing the path of the cycletrack. Do not forget, too, that no matter how much bike infrastructure goes in around Seattle or any other american metropolis/micropolis, the vast majority of roads will remain plain jane and unadorned streets. No one is going to put cycletracks everywhere so cyclists are prevented from riding bikes on the roads. Seattle, specifically, uses all manner of street treatment to enhance roads for cycling. And most streets remain unadorned. To posture against cycle tracks out of fears there’s going to be cycle tracks everywhere is a strawman. Yes, they are gaining popularity in cities across North America. and rightfully so, cyclists flock to protected facilities- your ‘first choice always’ if it can be implemented well in NYC, Vancouver and elsewhere cycletracks are installed. Do planners need to keep a close eye on intersection treatments, and improve ones that present inordinate amounts of traffic conflict? Throwing cycletracks to the curb out of fears they are going in everywhere is quite contrived. You will always be free to cycle the bike way on nearby Aurora Ave N if you don’t like the cycletrack at Bitter lake, Jan.
Cycletracks can be done well in cities in North America. Perhaps, even better than the ones in Europe, if we keep an eye on context specific design at decidedly north american intersections. I hardly think the cycletrack at Bitterlake presents insurmountable design issues, Jan, if you think the missing link’s commercial truck traffic, dock traffic, cement trucks and shoppers at Fred Meyer’s and Trader Joes’ can mix it up down in Ballard. Perspective is called for, Jan. You endorse cycle tracks when they can be done well, and consider separation your first choice for bicyclists if it can be done well. Pulling out the Bitter lake cycletrack isn’t the improvement the city is looking for, unfortunately. maybe you can assist the city in smart intersection design treatments for Seattle’s cycletrack network. Wouldn’t that be a coup? Cycle Track intersections designed with an eye to the experienced rider. ANOTHER followup to this blog post, talking about how, when and where you endorse cycletracks. Yes, I do consider cycletracks a great option if there are very few intersections. This rarely occurs in an urban setting. Seattle may be the exception, because we have bodies of water, and thus no cross streets for miles. That is why Lake Washington Boulevard is such a popular bike route. If you wanted to put a cycle track on the water side of that, it would meet the requirements. The Ballard “missing link” also goes along the water (Ship Canal) and has very few real intersections. The driveway count of the trail opponents includes every downspout, and most of those driveways are not used in weeks or months, if ever. Fred Meyer is a big one, but since it’s just one, cyclists can be prepared for it. If there was a Fred Meyer on every block, I wouldn’t ride on that trail. Trader Joe’s is more than a block off the proposed trail, and there is no street crossing it anywhere nearby. The alternatives are worse – they always put you on Market Street, which is very busy. Even so, I advocated for sharrows on the road in addition to the trail. The city installed both options west of the Ballard Locks. So under those conditions, a trail is indeed the best option. But those conditions are rare. Perceived safety and actual safety are too different things. Most cyclists cycle in the door zone when riding in bike lanes, rather than move a bit to the left (still in the bike lane) to be safer. American drivers bought SUVs, thinking they were safer, because they were bigger and higher… only to learn that they had a much greater roll-over risk and were much less safe overall. Do we promote the equivalent of SUVs to make people feel safe, only to have them get into even more accidents, because they let their guard down? I am not concerned the cycletracks will go in everywhere, but even one dangerous facility is one too many. There are alternatives that can make people feel as safe. Cycletracks are very expensive, and that money could be spent better. Jan, your safety assessments are way off the mark. For example, riders position further from doors in the presence of a bikelane, Cyclists DO move left when riding in bike lanes, further from parked cars in the absence of bikelanes. i mention Fred Meyers, and trader Joes, because when i ride my bike to trader joes, i’m going to want to cross the street to enter the cycle track. Another intersection crossing that needs mitigation. Your safety assessments are inchoate. Since the 1970’s Hunter studies, off road cycle paths have been found to be safer than riding next to traffic, either in a bikelane or not. The aim of cycle tracks is greater separation while considering intersection treatments. Just like the two intersections at Fred Meyer (thousands of cars a day) you think can be managed smartly, so can the intersections on cycle tracks in New York City, Vancouver, San Francisco or Bitter Lake. A network of well separated path -or cycletrack when appropriate – to serve as a backbone of a cycling network is an admirable goal for any city in north america. Rallying against fears of being forced off the roads should be reserved for the genuine threat of that, Cycletracks serving as the backbones of a cycling route are not that. Besides, separation is your first choice always, if it can be well implemented. Are you telling your readers that you oppose cities lengthening robust off road path networks that lead to the next county? What’s intrinsically wrong with beefing up a path route into a town, if the intersections can be designed smartly, and cyclists are still free to choose alternate routes? Surely, for a person who thinks separation is the first choice always if it can be done well, you can see the sense in extending quality separated path networks around towns and cities. You propose an utopia where well-designed cycletracks – even better than those in the Netherlands and Copenhagen – will make cycling convenient and safe. Even if this utopia was within reach, it is an unproven assertion, because nobody has yet built better cycletracks than the Netherlands and Copenhagen. And the data from Copenhagen shows that the best current cycletracks aren’t as safe as the facilities they replaced. The studies you quote, which compare accident risk from one country to another, are flawed. Having lived and cycled in Germany with poorly designed cycletracks, I can tell you that they are not an improvement in any way. In fact, the German national cycling advocacy group ADFC has lobbied hard against cycletracks, and finally, there are some successes. In Germany, cycling actually increases where they take out poorly designed cycletracks. We can and need to do better than what is currently happening. Yes, one study (that I’m aware of) showed cyclists riding A LITTLE farther from the doors when a bike lane was present (in the door zone), but still not far enough! Meanwhile, they give that not-far-enough position official sanction, and normalize the dangerous behavior. I find that totally unacceptable. Yes, it would probably be better if the bike lane consisted of 2/3 cross-hatched “door zone” and 1/3 “ride zone.” On the other hand, knowing car drivers, they’d park in the cross-hatched zone, and then we’d push cyclists further to the left. Unfortunately, not all cyclists know to ride far enough to the left, and “dooring” remains an issue. In New York we have 1 beautiful waterfront bike path, fairly well separated except when dump truck and drunk drivers hit cyclists; otherwise, there are sporadic paths lining streets & avenues, on the left as traffic goes, to keep bicycles on the other side of bus stops, I imagine. The separation is minimal, and there are parked cars [including police], vans & trucks blocking the paths 100%. I noticed more women on 2 wheels in traffic lately – the relative safety feeling derives probably from slower traffic speed. Another aspect: the presence of large number of delivery cyclists, who are to be found everywhere – both sides of the street, counter-traffic, on side-walks – perhaps makes motorists a bit more aware. So I am in favour of heavily mixed system on principle, because I want to take the bicycle to the coffee shop while wearing a suit and no helmet. They are finally going the way the Dutch have gone right from the start, and decades earlier (as I said on the other post): taking away road space from cars, prioritizing bikes over cars is the very first step to do BEFORE building ANY bicycle infrastructure. If bikes were truly prioritized over cars in the Netherlands, there would be no mandatory bike facility use on certain non-motorway roads. It can’t seriously be argued that cyclists have priority if their use of certain standard roads is restricted. Cyclists in the Netherlands have limited priority, because it only applies to some roads. I don’t know how it is in the Netherlands, but in Germany, if by bad luck, you find yourself in the street instead of on the sidewalk/cyclepath, drivers will react with great indignation (or worse) for not staying in your place – off the street. Even on streets where there aren’t bike facilities, drivers have the sense that cyclists don’t belong on the road. So if you are taking the lane on a small street, you will find drivers to be much less accepting than they are in the U.S. In Germany, everybody loves bicycles, as long as they stay off the streets. Politicians talk about prioritizing bikes over cars, but when it comes to a conflict over the same roadspace, cars (and especially truck – the key term is “freight mobility”) usually win out. Bike facilities are easily approved where there is excess space. Around here, that is mostly on roads where there are three wide lanes, one in each direction, plus a turn lane (also called “suicide lane”) in the center. It’s easy to restripe this so that you still have two lanes for cars, plus a bike lane. It’s changing slowly that bicycles are considered more than just the “poor” relatives, and we need to push harder for our seat at the table. Of course, without ridership numbers, this is hard to do, because the opponents easily can accuse the city to take away roadspace from the 90% (car drivers) to give more to the 5% (cyclists). It didn’t used to be that way in Germany. I spent 9 months traveling throughout Germany on my bike in 1984-86 and I used the road throughout the trip without a single murmer or honk from German motorists. Of course, attitudes can change in 30 years – especially when the government puts in side paths for bicyclists. I find that bike paths and lanes adjacent to a road make the general traffic lanes much more difficult to cycle on even when we have the legal right to use the road – because motorists assume we must use the bike facility. A very interesting and polarized discussion. One common theme, though, is the apparently universal assumption by automobile users that bicycles don’t have equal rights to the streets, and this, with the corollary that automobilists don’t expect cyclists, seems to be the principle problem, leaving cycling scofflaws, cycling ignoramuses, and inadequate infrastructure (legal and physical) as secondary problems. Once again I am convinced that the only real solution is for cyclists to become so ordinary that their presence, and their rights, are taken for granted by all. OTOH, I have no objection whatsoever to strict traffic training — even licensing? — for urban cyclists, and stiff penalties for scofflaws (if these realistically take into account the difference between cycling and driving in urban traffic). I still remember vividly small flocks of Kenyan cyclists, on battered, Indian roadsters, coasting at 30 mph, crouched over their bars, down the hills of the narrow, winding and potholed arteries leading into Nairobi; taking the center of their lane and moving aside for passing cars — which waited until they could pass. Again, I saw one bad cycling accident and that was due to a stupid Brit in a Jag passing on the outside of a blind curve at the beginning of a steep climb. Your description of Nairobi sounds like the dream for “vehicular cyclists”! It doesn’t help if you make it hard for automobilists to see the cyclists at all. Hiding them behind parked cars is a recipe for disaster. Putting them on the wrong side of the street is even worse. There are reasons we have traffic codes and enforce them. Imagine if some roads had you drive on the right, some on the left side of the street. Even with clear signage, it would create a lot of confusion. (Having driven in southern Africa, I know how hard it is to make the switch back and forth.) Yet for bicycles, we decided it was OK to put them on the wrong side of the street. You cannot complain that bikes have to use facilities, when the whole approach in the Netherlands is based on segregation wherever they deem it necessary. Where there is no segregation bikes almost always have have priority. It seems that the articles listed above discuss lanes and tracks that are relatively well designed compared to the American ones under discussion, yet accident rates are still shown to increase. Maybe I just need a little help interpreting, but I wonder if a shift in average ridership skill would explain a 10% increase in accidents. If a road has no facilities and has little use by cyclists, the average rider is likely to be confident and skilled, otherwise they would not be there. Add a bike track or lane (well designed), and a sharp increase of ridership occurs. These new riders are bound to be less skilled on average and more likely to be involved in an accident. I don’t believe the studies have a metric to account for a shift in average ridership skill, sice this is not recorded in accident reports as are age and gender. So a higher rate of accidents for my gender and age group does not imply that I personally would be more likely to be injured before or after the installation. I have been thinking about the same – whenever you get a lot of “newbies” in any activity, the skill level is going to be lower. However, the increases in accident rates roughly match the increases in ridership. This would mean that every “newbie” had an accident. This is unlikely, so it appears that the accident rate for experienced riders also experience increased accidents. The mechanism for these accidents is pretty clear. It would be surprising if you didn’t see increases in accidents for the same riders when you hide the cyclists from view, or even put them on the wrong side of the street. I think the answer can be summarized in two parts: 1) dangerous crashes with cars happen at intersections, and adding cycle tracks only increases the number intersections. And 2), less riders on the road will mean fewer drivers understanding how to safely interact with those on the road. I think the solution is to change the way everyone uses a road, and not relegate how cyclists use the road. The Neighborhood Greenways concept is intriguing if planners can truly make a network of streets designed for those not in cars as a priority. Also, changing lights so that all traffic moves through at a lower top speed but higher average speed would be best (averaging 20mph, rather than constantly going 0-30 while averaging 15). All other infrastructure changes just seem to relegate cyclists to paths with more intersections and less ability to ride along without constantly dealing with intersections, walkers, and other hazards that happen less from just riding on the roads. When on the subject of driving on the wrong side of the road, which sadly enough has become popular in Denmark as well along major roads, where it is cheaper to make just one bike path instead of two. there are instances, where it switches from one side to the other several times over just af few kilometres where You have to cross the road. Which does not increase safety. But it isthe most annoying when driving at night. It is difficult enough to get car drivers to tilt down their lights for You to begin with, but when driving on a path on the left side of the road. You still have the tilted down and to right light right in Your face. It’s always easy to quote out of context. – Separate facilities are great where they can be implemented safely. This means a low intersection density, since intersections are the danger spots for these facilities. – Intersection densities are high in most urban settings, so separate trails usually result in more accidents. See the Danish before-and-after studies. 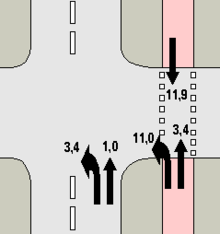 – The higher the intersection density, the more important it is to keep cyclists in the visible part of the roadway. – This doesn’t mean that cyclists should ride on busy streets and mingle with high-speed traffic. Careful route selection, aided by officially designated “bike boulevards”, allows cyclists to ride with minimal interference from cars. I am not going to misrepresent the position for separate trails. I value honest discussions, not cheap shots. statements and language. If your position is “Separate facilities should be built only in appropriate places”, don’t have subsections with titles like “Separate paths are less safe”. I value honest discussions too, and also clarity and concision of writing. I agree that the terminology is confusing. There are cycletracks, protected bike lanes, separate facilities and more. Just as confusing are the actual facilities. There are paths that are off the road, no intersections for miles. Then there are paths that are next to the road, but separated by a few flexible post. Some have cyclists going one way, some both ways. Some are behind parked cars or other “separation,” others are next to the traffic lane. Often, the facilities change from one version to another within a few blocks. As far as what is meant in the discussion, I wrote this summary to clarify things. Well, i’d like to see your design treatments for major commerical driveways crossing the cycle track you endorse at the Fred Meyer. Those crossings are a mess as it stands right now; how does Jan Heine design a cycletrack crossing for an american superstore parking lot driveway? Remember, Jan- paths and cycletracks will always be on a very small number of total road miles, that ideally will serve as the backbone of a cycling network. i’d suspect seattle to have more shared lane bikeways and bike boulevards than cycletracks, so your fears can be put to rest. Me, i like some of the ‘cycletrack’ designs i see going in around america, NYC looks like a changed city to bike in. I’ve only read good reports on the protected lanes in Vancouver BC, and the ‘cycletrack’ on Market Street in San Francisco can only get better. I await the accumulation of fresh data on north american cycletracks- what works, what doesn’t. The green lane project – Memphis is one of the test cities – will likely render a lot of data about modern american cycle track installations. You’re missing something in the video of the Dutch junction. That is an interesting concept, and one that has been used in the U.S. for pedestrians in places where there is a lot of pedestrian traffic. The Pike Place Market in Seattle is an example. Note that *all* conflicts involving automobiles are eliminated (unless someone runs a red light). If you’re driving a car and turning left, the oncoming traffic will always have a red light. This ought to significantly reduce the time wasted on the “clearance phase”, as there should never be a car sitting in the middle of the intersection waiting until after the light has changed to get an opportunity to make his turn. It still takes time, of course, and I’m sure that’s one reason why the Dutch seem to be switching to roundabouts instead (but again, they have to be designed properly to accomodate cyclists safely, with a space for an exiting car to fit between the lane for through motor traffic and the cycle path). If you want to comment on the quality of cycle path design, it really behooves you to take an interest in the country which has far and away the best cycling infrastructure (and the best safety record — and not just for cyclists). True, it’s very unlikely that blinkered Americans will ever build something truly sensible, but the more of us that do take an interest, the less unlikely it becomes. They certainly won’t build it if we don’t ask them to. Jan, if you’re going to throw around that Danish before-and-after study, I really think next time you should read it first (and not just the abstract). The increase in crashes is largely due to bicycles hitting other bicycles (hardly resulting in injuries, let alone death). Only right turning traffic was a significant problem, and that I can assure you, is due to the crappy design they employ in Copenhagen. The dutch design you show in the video, does not have this problem, and after proper research and testing, is deemed much safer than any alternative (for high volume, urban roads). Your criticism of the dutch design (“Most drivers and cyclists try to time it so that they arrive when the light is green”) is completely incomprehensible to me. When which light is green? The one for cars or the one for for cyclists? Hint: They’re never green at the same time. The “dangerous situation” that you anticipate, simply cannot occur unless someone runs a red light. Sorry I am not that familiar with the Dutch designs. The “right turn risk” is one of my main concerns with bike paths. Cyclists hitting each other is not as benign as you may think. Bikes have many protruding, sharp edges, and there have been many fatalities from cyclists hitting each other head-on even at low speeds. When given a choice between being hit by a modern car and a bicycle, the car is a much better bet. If this is what you’re talking about, there is no way to tell what the author means by “considerable” – it could be more, could be less. No way can you determine that “The increase in crashes is largely due to bicycles hitting other bicycles”. Ah, the devil’s in the details, isn’t it, Jan? At the Shilshole urban cycle track you endorse in Ballard (Seattle) that crosses a major commercial superstore parking lot entrances twice, cement factory, and working dockyards, is going to leave a lot of bike commuter traffic on the wrong side of the road at 24th at Market. How will Jan Heine’s cycletrack design get the majority of the commuter bike traffic across the street and onto the correct side of 24th to head north? The rail line and bike path goes a block south of Market Street, so it’s not “on the wrong side of the road.” At 28th Ave, there alreay is a traffic light that would allow crossing Market. 28th is a prime candidate for a “bike boulevard” that goes up north. In fact, I take 28th already when I ride northward in Ballard, since I don’t like cycling on 24th when going uphill. So there are solutions if you are willing to think creatively, whereas this “gotcha” attitude doesn’t get us anywhere. Sorry, I meant 28th, It’s been a couple of years since i lived in seattle. 28th, where your proposed cycletrack will place all the commuting traffic on the wrong side of the road to continue up 28th. you saying on this commercial district cycletrack you endorse for Ballard, you simply want cyclists to cross at the light from the left side of the road from a separated cycletrack, to get to the right side at 28th in Ballard, where there’s significant amount of left turning traffic. I did a bike count one year at that location, traffic management is a mess for cyclists winding up at that spot in front of the pub. But, you propose the cycle traffic there simply use the crosswalks(?) to regain the traffic stream on 28 or on Market? How in the world is Seattle DOT supposed to design that intersection crossing? Should there be preferential signal heads for the bike traffic? I’m not sure you’ve given this cycle track business a lot of thought, Jan.
Paradoxically, you say they’re a good idea some places, but not others, and endorse cycle tracks on routes with significant crossings to be mitigated (the fred meyer driveways are pretty major crossings, as is the 28th and market, and the cement trucks, even with well trained drivers, will be threatening to cyclists without some intersection controls there). The intersection dangers on the bitter lake cycle track are very minor, likely more minor than any in Ballard on the cycletrack you want for cycling there. NO ONE is proposing a ‘one size fits all’ solution of cycletracks on every street taking away cyclists right to ride on seattle streets. That’s a quixotic and contrived fight. Seatle wants to beef up a core backbone of protected lane miles to serve as a backbone of a cycling network, some of the protected miles of which you DO endorse. just not the ones that fail to pay attention to the traffic details. Fair enough, a call for smartly designed cycle track intersections. Sounds like a plan. Don’t forget, the real threat to cyclists right to ride is legislation against cyclists, not a few miles of cycletrack. 28th Ave extends beyond Market, so crossing it is easily possible at the light that already exists. It would connect to the trail where it currently dead-ends. So there would be no trouble at all in this location. When you next visit Seattle, I suggest you look at the new cycletrack at Bitterlake that you seemed to like so much without ever having ridden it. I’m seeing a pattern. Jan Heine wants protected cycling routes of varying degrees of separation from traffic, on routes he uses, up to the level of his traffic comfort. Can’t ride the aurora ave bikeway, but doesn’t want a cycle track nearby. Likes the idea of a cycle track in Ballard (perhaps riding in the road on Shilshole is uncomfortable for Jan), doesn’t mind sharing the road in the neighborhood once crossing Market street. How do you get to the Dennys on Aurora or the Performance store on the Eastside, Jan? In fact, do you even ride your bike in Bellevue? Judging from your commentary at your blog, you might not, as you’d find many of the roads in Bellevue unfit and unsafe for cycling. Of corse, some of us commuted by bike to Bellevue, and think riding BelRed road is just part of the north american cycling experience. Subpar and repressive to cycling participation and equity. The german bike federation of sport cyclists are against mandatory bikelane laws, not paths and bikelanes generally. Kind of the position myself and a few other cyclists concerned about cyclists rights promoted in Washington in 2010, while other cyclists were apparently asleep on the handlebars. I rarely would use the “missing link” trail in Ballard, since my bike routes don’t take me along there. The few times every year when I go there, I don’t mind riding on Shilshole, although I usually detour a block up to Ballard Avenue, because I like the old buildings and trees. It’s not that I am uncomfortable mixing it with traffic, but I prefer to ride in more quiet surroundings. My advocacy for the Friends of the Burke-Gilman Trail was for purely altruistic reasons, as a way to give back to my community and promote cycling. Regarding the mandatory bike lane law, you are right, I was unaware of it. In fact, even the Cascade Bike Club’s Blog doesn’t seem to mention it. Assuming it really was proposed as a “stealth law”, I am glad you prevented this from happening. If you had been more public in your fight, I and many others would have joined the fight. This new initiative for the mis-named “protected” bike lanes also caught me by surprise. But at least I am not “sleep at the handlebars” this time! I find the tone a bit too ad-hominem – I think it is more appropriate & decorous to criticize facts & theories. One ought to avoid the piano player if not to one’s liking. First of all, thanks for your great blog. Your blog is the only one I bother to read these days. I thought the attached article might make you laugh (or cry)!